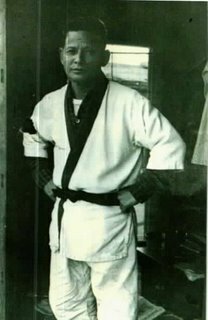 Dave Lowry, a respected martial arts author and frequent contributor to Black Belt magazine, recently decried the use of the title master for senior instuctors. To call oneself a "master", Lowry asserts, implies false-pride and vanity. A meijin (master), by my definition, is one who has, in part, reached the pinnacle of skill in an art. The master has assimilated all the knowledge there is to be had; all that is left is a final act of altruism: to show the way through teaching. But who or what gives the master absolute authority? How can we tell a true meijin from a fraud? There is no ideal model for what a real master should appear as; some are aloof and stern, others are warm and hospitable, others still seem so ordinary you wouldn't look at them twice. Beyond the creative genius and technical prowess of the genuine master lies something even more profound. In addition to warriorship, the true meijin expresses the qualities of wisdom, compassion, and the willingness to impart her/his knowledge to the compliant aspirant. The strengths and weaknesses of the student are carefully considered, and the appropriate lessons are rendered accordingly. Above all, self-reliance and self-expression are encouraged. Mysteriously, people seem to attract the guiding force that is best suited for them precisely when they need it most. Perhaps there is truth to the aphorism, "When the student is ready, the master will appear." You're like the karate "yoda." I love reading your posts! Thanks for posting in my blog! Came over to check yours out, and it's very interesting! (And I mean that in the sincere way! ;-)) Being that we are from different disciplines, it's interesting to see the perspective you have. I agree with a lot of what you are saying, and I find that the group that I'm associated with, Songham Taekwondo (see ataonline.com), a lot of what you talk about here is very similar to their own philosophies. Even the GrandMasters have to go through rigorous testing and approval procedures before they earn their status, and it's one that's given by peers, not just inherited. I was just reading about it tonight, in fact. In ours, the Grandmaster is a 9th degree black belt, and I think to become just a Master you have to be about 6th or 7th (I'm leaning towards 7th off the top of my head). Of course, I haven't even gotten my 1st degree, and I am guessing it's still about a year away. I'll be bookmarking you for extra reading! Thanks again for making the connection! Should there be a difference between master and teacher? should only a master be teaching in this case? There should be some minimal requirements set in order to become a master/teacher. hmm more importantly I think in order to preserve some value/qualities of martial arts we need to stop it from becoming a sport. Its the martial values and principles of martials arts that makes it special. I agree with blackbeltmama. Your blog is always interesting and I really like to get "your take" on things. As far as a pic of my kick, I don't have any karate pics of me because I don't allow anyone in my family to attend my exams. Sounds crazy but I do better when they aren't there. Just call me paranoid! Maybe the saying is true. I agree with the above. I love your blog! Always interesting.. short and sweet.. and great pictures to accompany the information. "is one who has, in part, reached the pinnacle of skill in an art. The master has assimilated all the knowledge there is to be had;"
I can't help but think "What a sad thing to say about one's path in the arts! That I have assimilated all the knowledge, and there is no more to learn. I hope that as I gain in knowledge, I will find more questions to intrigue me into learning even more, so that I never end my efforts as a student as I continue going up the mountain of my art. As I travel up, I would be happy to point out the lower pathways to those who want to join me in my quest.."
That's a good point Mireille. Einstein once said that knowledge is good, but discovering new facts is essential and never ending. I suppose if one possessed ultimate knowledge, (in any field, if such a thing even exists) it really would be tragic.